Home > India Demonetisation > The total amount of fake currency would be much larger than the amount seized..! The total amount of fake currency would be much larger than the amount seized..! Data released by the home ministry in an answer to a Lok Sabha question, shows that government agencies seized counterfeit currency worth Rs.1,551 million between 1 January 2013 and 30 September 2016. This is a mere 0.01% of the amount of currency demonetised. It is even lower if we consider the total currency in circulation of about Rs. 17 trillion as on 30 September 2016. 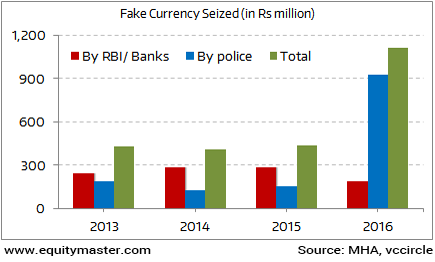 Of course, the total amount of fake currency would be much larger than the amount seized. But even if it was a 100 times larger, it would still be nearly 1% of the total amount demonetised. But the news is worse than this. A study by Indian Statistical Institute in association with the National Investigative Agency shows that the face value of the fake currency in circulation was only Rs. 4,000 million at any point of time in the past four years. This begs the question; did the media and the government make a mountain out of a molehill?